A child's first dental visit will usually be the basis on which the child views the dental experience for the rest of his or her life. Adequately preparing a child for their first dental visit will help allay any fears they may have, and will also set in place guidelines that will lead to a lifetime free from serious oral problems. 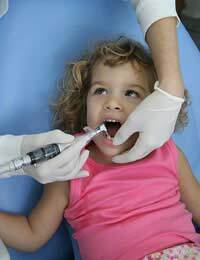 Opinions vary from dentist to dentist over the best age for a child's first dental visit. Some dentists believe the best age is around four years old, when the primary teeth are fully formed. Other dentists suggest that the first visit should come somewhere between six months and one year in order to properly evaluate the eruption sequence of the teeth. Visiting the dentist this early will also give parents the chance to gain information on oral hygiene and nutrition that will keep the child's teeth and gums healthy. Children will not usually have a natural fear of the dentist; any fears they may have can only come from listening to other people's dental experiences. When preparing your child for their first dental visit, it is vital not to use words or phrases that will instil a fear of the dentist. Do not use words such as needle, drill or hurt and do not use phrases such as, "Going to the dentist doesn't hurt much." Never use the dentist as a threat or as a punishment to the child, and do not let the child hear any stories of bad previous dental experiences from siblings. Make the first trip as enjoyable as possible for the child; dentists are more than happy to permit a simple visit in order that your child can become familiar with the dental practice. Highlight the positive aspects of the visit; the doctor who will look after their teeth, the elevating chair the child will sit in, the camera that will take pictures of their teeth. Although you may have adequately prepared your child for their first dental visit it is still not uncommon for young children to cry during their first dental exam due to unfamiliar surroundings and anxiety. Staying calm and relaxed and talking to the child will help allay their anxiety, dentists are very used to small children crying and will also be very supportive. If you have adequately prepared your child for their first dental visit then the trip should turn out to be an enjoyable experience for both the child and the parent. This in turn should lead to a lifetime without fear of regular dental visits, and hopefully, a lifetime of healthy teeth and gums. There is a wealth of books and videos available that is specifically aimed at a child's first dental visit. Many of the characters in the books and videos will be popular cartoon characters and these are very helpful as another aid to allaying any fears your child may have of visiting the dentist.